In 1997, Nagoya began to feel the pinch of a waste crisis. Landfill space in this city of two million was running out, and a plan to develop a new landfill in the Fujimae tidal flats was facing intense public opposition. Local political leaders and government officials were being criticized from all quarters and had little choice but to heed the pressure. A few years prior, a national legislative system had been created to promote a recycle-oriented society, and Nagoya City Council decided to jump on board. In 1999 the landfill plan was cancelled and a “Declaration of a State of Emergency for Waste Management” was issued, calling on local citizens to fully participate in the achievement of waste reduction measures. 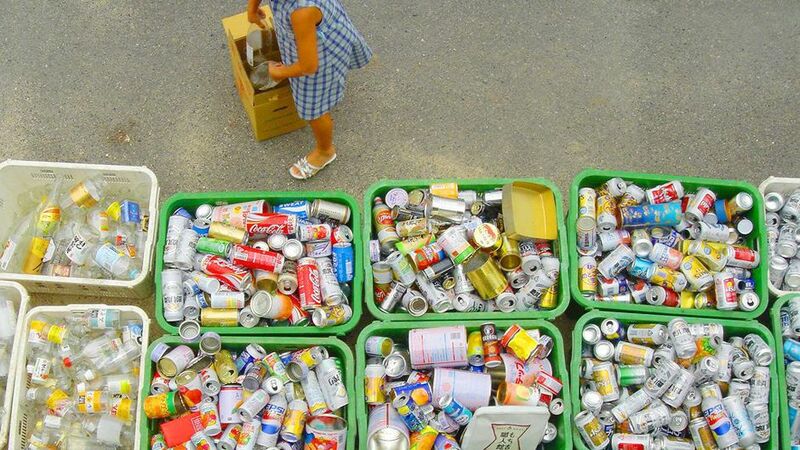 In 2000, Nagoya adopted the Containers and Packaging Recycling Law. The results were dramatic, not only in terms of the reduction of waste but also in terms of decreasing levels of CO2 and NOX generation. As an added bonus, the Fujimae Tideland was designated as a Wetland of International Importance in 2002. Nagoya’s crisis came at a time when waste levels had been climbing for many years, standing at 1.2 million tons when the declaration was issued. The original target for waste reduction by 2000 was 258,000 tons. To achieve such a reduction would indeed represent a waste management revolution. Amazingly, the city authority’s data confirms the policy’s success, showing waste falling from 1,022,000 tons in 1998 to 917,000 tons in 1999 and down further to 787,000 in 2000, very close to the target. At that point, it would have been all too easy for Nagoya to rest on its laurels and declare the problem solved. However, the citizens maintained their efforts and the levels fell to 760,000 tons in 2001, representing a 25% decrease over the three-year period. The most recent data shows that the amount of non recyclable waste was 722,000 tons in 2006. That is a reduction of 300,000 tons, or nearly 30% compared to 1998 levels. Quite extraordinary. Equally as impressive is that the amount of materials recycled jumped from 151,000 tons in 1998, to 355,000 tons in 2002. That is a twofold increase in just four years! Local researchers also began calculating the impact of these measures on CO2 and NOX levels. They compared data for 1998 and 2001 and concluded that the introduction of these waste management measures under the Containers and Packaging Recycling Law resulted in a reduction of CO2 and NOx by over 34% for that period. How was such a dramatic transformation possible? Well, some might say that a crisis always helps precipitate dramatic action. More accurately, Nagoya’s success illustrates that once a decision to significantly reduce waste was made and targets were set, local government officials and communities came together to discuss how best to meet those targets. Brochures and other informational/educational materials were then distributed indicating how to sort waste and recyclable materials. Citizens really are the stars of this revolution, since they energetically engaged in sorting waste and recyclable materials. They were supported by community-based organizations and non-governmental organizations. As with any revolution, there will always be discontent. There were concerns expressed that the new laws did not reflect ‘the polluter pays’ principle, which would have called upon the actual manufacturers of the packages, containers and products to bear some of the responsibilities and shoulder some of the costs. Instead, the high price for collection, transportation and storage of the waste and recyclable materials fell on the local government. In addition, not all citizens understood the need for and manner of collecting, sorting and recycling materials. In the first three months of implementation, the local government received around 20,000 complaints. The local government responded by organizing workshops for local citizens and providing better explanatory materials, to ensure that everybody had a better understanding of the importance of recycling and how the scheme works. Thanks to this waste revolution, Nagoya now has the lowest per capita waste generation, highest per capita recycling and lowest per capita waste going to landfill of all big cities in Japan. They remain committed and are keen to do more. New targets have been proposed to reduce waste to around 620,000 tons by 2010, which would put them back at 1976 levels! What is more is that they want to reduce the amount sent to landfill to as near to zero as possible. They have also started introducing new types of targets, including measures to reduce “nama-gomi”—mainly food wastes—by 20%. This would require cooperation from food processing companies, restaurants and shops, as well as from the citizens of Nagoya. There are so many lessons that others can take from the experience in Nagoya. However, the key point is that it is crucial to engage the community, to constantly give them feedback on progress and to thank them for their efforts. For, as with all endeavors, enthusiasm wanes with time and progress stalls. In Nagoya, this has been avoided through efforts to make waste reduction a part of every day life and to show how cool it is to recycle. They use the term “re-style.” People who don’t care about waste, who are happy to just throw things away, are uncool! Thankfully, the need to fit in is part of human nature. When everyone around you is making that little extra effort to make things better, it is rather difficult to remain a slob. Ideally we will see a similar attitude catch on regarding reductions of CO2, especially if Japan is to become a Low Carbon Society. Nagoya’s waste revolution by Brendan Barrett is licensed under a Creative Commons Attribution-NonCommercial 3.0 Unported License.